Race becomes an issue early in the text, suggesting that after divisions arose between the civilizations, God cursed the unrighteous Lamanites with a sore cursing: a “skin of blackness.” Non-white skin color served as a pronouncement from God about the character of a people; but the transformation was also preventative—to make the Lamanites loathsome to the Nephites. God gave the Nephites a color-line. Eventually, the Nephites became an unrepentant people themselves and were destroyed, while the Lamanites forgot their Semitic origins. In the Mormon Miracle Pageant, both Nephites and Lamanites are represented: both wear costumes exhibiting the Pan-American Indian motif; but only the latter are performed in brownface. However, despite the brownface, the impulse to play Indian as a Lamanite, rather than as an Indian, reflects a religious permutation of Deloria’s theme that he did not address but which the work of Richard Dyer can speak to. 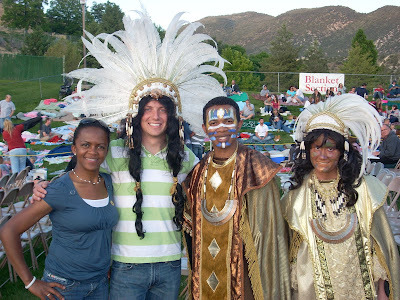 The Christianity of Mormonism is significant to understanding the racial construction of whiteness in The Book of Mormon and the Mormon Miracle Pageant. This religious framing is important to comprehend how playing Indian as a Lamanite is actually a construction of whiteness dependent on a conversation not with an Other but with another not quite white identity. So much not quite white going on this picture. Dyer argues that Christianity provides a sense of self in relation to bodies; Christianity is a “religion whose sensibility is focused on the body.” Christ’s divinity is narrativized through accounts of his birth, death, and resurrection, as well as miracles of bodily healings he performed. As a religion, Christianity practices ordination and sacraments through embodied ritual. Over the centuries, the faith has contributed to the formation of a Western philosophy of bodies—that bodies are vessels animated by an external force internalized by the body. The Book of Mormon attributes this paradigm to both the Nephites and the Lamanites because both groups were converted to Christianity centuries before Christ’s birth. Despite Semitic heritage, Nephites and Lamanites—for an 1830 readership—could be read as white. Dyer explains that through the Crusades, Europe racialized Christendom; Christ and the Virgin Mary became gentilized and whitened. Pre-Christian converts to Christianity could be read as white by an 1830 readership. Furthermore, the Nephites and the Lamanites wandered in deserts, crossed a tempestuous sea, and lived on faith that God would provide food all before reaching America. Much like the trials of the Caucasus Mountains tested and created whiteness, the trials of the origin narrative in The Book of Mormon effectively made the Lamanites and Nephites white long before the sore cursing. God put a skin of blackness upon the Lamanites, but ultimately, Lamanites (in the logic of the text) are inherently a white civilization with a curse that can be lifted by God if it is His will. How exactly the pageant works through the requirement to embody races in order to stay true to the source material reveals how a contemporary religion approaches its pre-1978 scripture in a post-1978 way. The sacred text of the religion is a collection of racial projects. As will be discussed, the solution to this tension is not uniform across LDS Church pageants. But Manti’s pageant does indicate a moment of disruption—when the desire to embody sacred histories requires an allegedly post-racial faith to perform the racial projects embedded in its sacred texts. Philip Deloria, Playing Indian (New Haven, CT: Yale University Press, 1997), 65. They were not destroyed because Lamanites, as a civilization, were not under the same obligations as Nephites. I recognize the origins of the phrase “not quite white” in the work of postcolonialist theorist Homi Bhabha, particularly in his work on the ambivalence of mimicry in The Location of Culture. However, I am actually coming at the concept through Matt Wray’s book Not Quite White: White Trash and the Boundaries of Whiteness (Durham, North Carolina: Duke University Press, 2006). Wray deals specifically with whiteness in America and racial projects that have policed the boundaries of whiteness to ensure its position of privilege. I point to Wray rather than Bhabha because of the construction of the Lamanite is paradoxically both white and non-white, thus not quite white. Bhabha develops the phrase in relation to non-white bodies mimicking white imperial bodies, whereas Wray deals with how white bodies were made into an Other and used to construct a whiteness that they could not have access to. I find the narrative whiteness of Lamanites to have more in common with that racial project than the one Bhabha developed when he coined the phrase.